“They would sell their possessions and goods and distribute the proceeds to all, as any had need…There was not a needy person among them” (Acts 2:45; 4:34). As people of the Way we are called to generosity: “They would sell their possessions and goods and distribute the proceeds to all, as any had need…There was not a needy person among them” (Acts 2:45; 4:34). These passages in Acts are not mandating a specific economic or social system for all times and all places; rather, they are describing how those first Christians practised radical generosity as the practical expression of the love of Jesus. We are called to generous giving. The New Testament highlights a few key ideas related to financial giving: 1) we are to give in order to meet specific practical or spiritual needs; 2) the model is not “tithing,” but “giving according to one’s ability”; 3) giving is not mandatory, and it is certainly never to be coerced; rather, it is entirely voluntary; and 4) we are called by God to give generously and freely, in love and faith. We are also called to generous living. Generosity isn’t just about money—it’s about an entire way of life, a way of being. Generosity is not just about open wallets to give some money to solve a problem. It is about having open hearts of empathy and compassion toward others, open minds to listen to others and learn from them, and open arms to receive others as sisters and brothers. How am I doing in “generous giving”? Are the causes I support meeting specific practical or spiritual needs? Am I giving as much as I am able? Am I giving without obligation, without expecting anything in return? Am I trusting in God to provide my needs? How am I doing in “generous living”? Do I look to others—especially those who are very different from me—with an open heart, an open mind, and open arms? Based on a sermon delivered at Morden Mennonite Church on September 20, 2015. This entry was posted in Michael Pahl and tagged acts, church, generosity, jesus, people of the way. Bookmark the permalink. Generosity in giving and living is loving your neighbor as yourself. 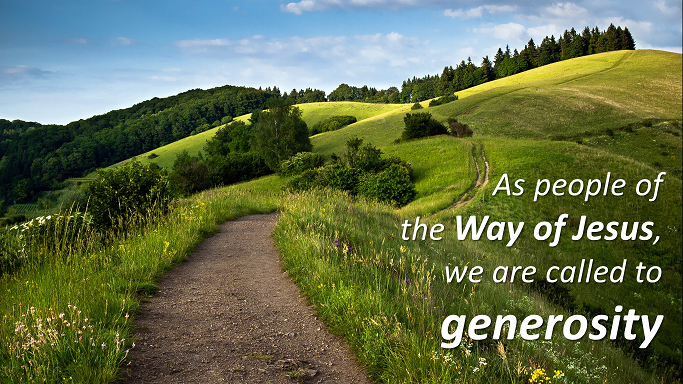 Lord, help us to follow You and walk in Your Way.